en-suite, with separate shower, bath and twin sinks . Two twin bedrooms each with it's own ceiling fans. The main bathroom as a bath and shower also twin sinks. Twice weekly linen change extra towels are provided. Hairdryers are provided, also beach towels. The kitchen is well equipped with a ceramic hob, oven, microwave, dishwasher, two fridge-freezers, toaster and kettle to name just some of the conveniences. From the kitchen there is a connecting door to a utility room where you will find a washing machine and drying area iron and ironing board. Champagne White wine ,Red Wine,Beers,coffee,tea,milk,bread,butter,water, jam,cornflakes etc, on arrival. The outside area is further enhanced by a large terrace with dining table out door rattan patio furniture and cushions sun loungers , brick built barbecue, American pool table, table tennis etc. This area is for those who seek space, tranquillity and seclusion, without sacrificing the local amenities of Puerto Del Carmen, Old Town and harbour, which are only a ten minute walk. The main central avenue of Puerto del Carmen with its fine sandy beaches and a great selection good restaurants, shops and supermarkets. Air Conditioning to the lounge and main bedroom is.Coin operated very economical ,Ceiling fans to all bedrooms. PLEASE NOTE WE DO NOT ACCEPT ALL MALE AND FEMALE PARTIES. 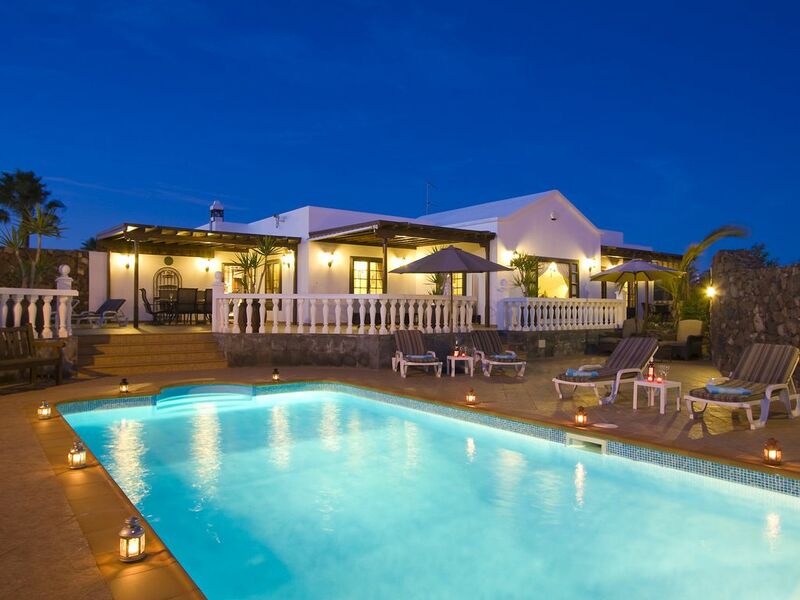 Lanzarote: is perfect for a fabulous sunshine holiday, it lies in a sub-tropical location just 80 miles from Africa. There are many sites to see that have been created by the volcanic activity over thousands of years. Timanfaya National Park is an amazing phenomenon, where if a stick is pushed into the ground it will catch fire immediately due to the heat in the ground. Cuevas de los verdes (the green caves) are lava tunnels produced by volcanic eruptions. These are one of the longest in the world, stretching 7 km below the sea and visitors to the caves can walk 1.5 km down into them. Some of the volcanic soils are very fertile and the Island has its own 'wine region' from which the delicious Malvasia wine is produced. Puerto del Carmen: Situated on the Coast this is the liveliest and most popular resort on the Island. It as developed along side a long curve of gently sloping fine dark sand, which stretches to Playa de los Pocillos and Matagorda,. I have stayed at Villa Bellisima several times now and Eric and Pauline never fail to impress. Always spotlessly clean with all the facilities you could wish for. Any little hiccups during the stay are promptly and efficiently taken care of by Eric and Lionel and nothing is ever too much of a problem. If you want a fabulous holiday in a gorgeous villa...this is it. Can not fault the place. It’s beautiful. So quiet and peaceful yet not far from the centre. The place is immaculate and has everything that you need. The welcome hamper is a delightful touch and very generous compared to other places that we have visited. The pool is beautiful and warm, so clean and safe for children to swim in. There is an ambundance of seating areas which is great if you go with a family of 6 (we was a family of three and loved having the space!). Communication with Eric was spot on, he is so friendly and helpful. Lionel and the cleaners are faultless too. Can’t reccomend the place highly enough and will be returning. Thank you. We recently returned to Villa Bellisima for our 4th visit. Everything was perfect as always. We loved this Villa, spotlessly clean and luxurious. The welcome pack when we arrived was a great touch. On top of the swimming pool there is ping pong, darts and a pool table, great for entertainment. The location is great too, so peaceful yet within walking distance to the shops and restaurants. Thankyou for a fantastic holiday. A stunning villa, closer to the old town and to the beach than we thought, yet in such a peaceful location. We spent most of our time around the pool for the whole week and hardly ever even heard a car!. Many thanks for everything, the welcome pack was a great bonus. The Nicholls family.